COMMUNITY CHRISTIAN CHURCH, U.S. 51 South (across from Vietnam Memorial). Sunday: Worship, 9 a.m.
FIRST PRESBYTERIAN CHURCH Sunday: Worship, 9:30 a.m.
Sunday School (for all ages) 8:30 a.m.
Services, 9:15 a.m. and 4 p.m.
Sunday Masses, 7 a.m. and 11 a.m.
SAINT PAUL'S LUTHERAN CHURCH (WISCONSIN) Sunday: Worship 10:45 a.m.
Sunday worship 9:30 a.m. Holy Communion is the 1st, 3rd and 5th Sundays, Rev. Mark Mischnick,Pastor. SAINT ALBERT Saturday Mass 5:00 p.m.
LAND 0' LAKES BIBLE CHURCH Sunday School 9:00 a.m.
Wedsneday. Bible Study & Prayer 7:00 p.m.
CHURCH OF NAZARENE Sunday Bible study, 9:30 a.m.
SAINT ISSAC JOQUES CATHOLIC CHURCH Saturday, Mass 5:30 p.m.
UNITED METHODIST CHURCH Sunday worship 9:30 a.m.
ZION LUTHERAN CHURCH (WISCONSIN) Sunday Worship, 9 a.m.
Bible class 10:15 A.M. (September through May). BETHEL LUTHERAN CHURCH Sunday worship 11 a.m. (June 20 to Sept. 5). 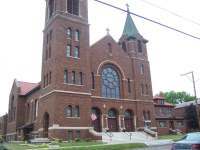 SAINT RITA'S CATHOLIC CHURCH Saturday, Confessions, 3:30 p.m.
Sunday Mass, 9:00 a.m. (Memorial Day through Labor Day). COMMUNITY PRESBYTERIAN CHURCH Sunday worship 11:00 a.m.
SAINT ANN'S CATHOLIC CHURCH Sunday Mass 8:45 a.m. LIVING HOPE CHURCH Sunday worship, 9:30 a.m.
Thursday, Bible study, 7:00 p.m.
Holy Communion first and third Saturday of each month. CHRIST COMMUNITY CHURCH OF SDA 507 E. Cinnabar Street. Wednesday prayer meeting, 6:30 p.m.
Communion first and third Sunday. Sunday School 8:50 a.m. Sunday: Worship, 9 a.m.
Sunday: Worship service. 10:45 a.m.
Bible study Wednesday at 7:00 p.m.
Wednesday Music Ministry 6:30 p.m.
Open Door Sunday School at 9:15 a.m.
Gateway Apostolic 102 S. Mansfield. Sunday Services 10:00 a.m. and 7:00 p.m.
Saturday Worship Service 6:30 p.m.
Sunday worship, 10 a.m., 6:30 p.m.
Sunday: Worship services, 10:30 a.m. and 6:30 p.m.
Wednesday mid-week service 6:30 p.m.
Sunday masses, 8 and 11 a.m.
ST. JOHN'S LUTHERAN CHURCH(ELCA) Airport Road. Weds. Church School 3:15 p.m.
Summer service Sun. 9:00 a.m. and 10:30 a.m.
WESLEY UNITED METHODIST CHURCH McLeod and Mansfield. Wednesday, Midweek prayer and Praise, 6:00 p.m.
Sunday Services 10:00 a.m., 11:00 a.m. and 6:00 p.m.
IMMACULATE CONCEPTION CATHOLIC CHURCH Saturday Mass, 4:00 p.m.
UNITED METHODIST CHURCH Sunday Service 9:00 a.m.
CALVARY BAPTIST CHURCH Sunday Worship I I:00 a.m.
ST. ANN CATHOLIC CHURCH Father Thomas Ettolil, Pastor. Sunday Mass at 11:00 a.m.
Holy Communion on 1st and 3rd Sundays. Church Phone: 827-3295. Last Sunday's sermon is broadcast on WUPY 101.1 FM at 8:00 a.m.
BETHANY LUTHERAN CHURCH (WISCONSIN) Pastor Burgess Huehn, 715-561-3242. 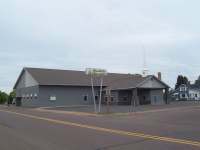 BRUCE CROSSING BIBLE CHURCH: Stannard Township Hall, 14927 Hwy. M-28. Pastor Skip Pullen 827-3279, 827-3670. BETHANY LUTHERAN (ELCA) Sunday Worship 9 a.m , coffee following service, Council Meeting 2nd Thursday of the month 6:30 p.m.
SACRED HEART CATHOLIC CHURCH Sunday Mass 9:00 a.m.
FIRST LUTHERAN CHURCH Pastor John Kuziej Parsonage (906) 988-2318. Wednesday school for children, after school. SEVENTH-DAY ADVENTIST CHURCH Greenland & Firesteel Rds. Saturday Sabbath School, 1 I :00. a.m. The public is welcome to attend & worship. Pastor John West,, 883-3602, 883-3450. Holy Communion on the 1st & 3rd Sunday of each month. 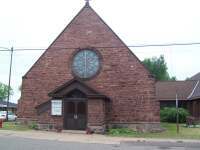 ASSEMBLY OF GOD 104 N. Steel St., Ontonagon. 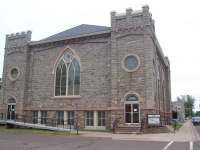 906-884-4622.
which meets at the Heritage House, 209 S. Steel St.
Sunday: Sunday School, 9:45 a.m.
Evening Service at 6 p.m.
Wednesday: Bible Study and Prayer Time, 6:30 p.m. Reformers Unanimous, at 7 p.m. Friday. 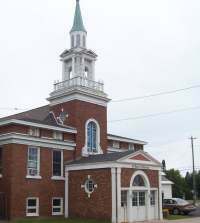 THE ONTONAGON PLAYGROUP Meets at the Baptist Church every Tuesday; 9:30-11:30 (except on school holidays and snow days). Playgroup is for children 5 and under accompanied by an adult. Plenty of toys; come and join the fun! If you have any questions call Becca at (906) 884-6706 or Laura at (906) 884-6777. Praise & Worship God with music and hear the Word. Coffee - fellowship afterwards. Bible study and prayer Tuesday 12:00 noon. 9:00 a.m. Fr. Antony Lukose, Pastor. The Rev. Jeannie Manning, 884-2347. Sunday service at 10:00 am with coffee hour following. Offering a life-giving place at the table for all. First Wednesday of month Outreach/Evangelism 8 p.m.
Sunday: 8:45 am, morning worship, nursery provided; coffee fellowship following. 6 pm Bible Study at Maple Manor. Church school on Wednesdays, from 3:30 to 4:30PM. Children & youth from preschool to High School are invited to enjoy an hour of food, fun and facts with Pastor Cherrie & other leaders. 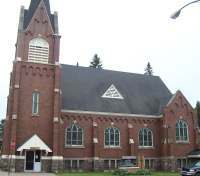 Elementary school children will be met and escorted to the church if desired. Call (906) 884-4556 and leave a message. OUR SAVIOUR'S LUTHERAN CHURCH Pastor John Kuziej 906-988-2318, 988-2594. Friday School for Children 3:30-5:00 pm. 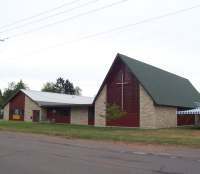 PAYNESVILLE APOSTOLIC LUTHERAN Sunday Worship Service with 10:30 a.m.
ST. MARY CATHOLIC CHURCH Wednesday Mass at 9:00 a.m.
Saturday - Confessions at 3:30 p.m.
SAINT FRANCIS XAVIAR Sunday Mass 2:00 p.m.
UNITED METHODIST CHURCH Sunday Worship Service 5:00 p.m.
Second Sunday Fellowship meal following worship service. Communion on 1st Sunday of each month. FIRST UNITED PRESBYTERIAN CHURCH Worship services Sunday 11:00 a.m.
Communion 1 st and 3rd Sundays. Church Council meets 1st Wed. at 7 p.m. Morning Worship 10:00 a.m. .
IMMACULATE CONCEPTION CATHOLIC CHURCH Saturday Mass 4:00 p.m.
Sunday School & Adult Bible Study at 10:00 am. Worship Service at 11:00 am. 4th Sunday Worship Service is at 2:00 pm. Holy Communion first and third Sunday of each month. SAINT JUDE CATHOLIC CHURCH Sunday - Confessions 10:30 a.m.
Wednesdays Youth group 6:30 p.m.
Christian Kids Club Fridays after school.